Jon is unbelievably valuable to this team. He’s calm, collected, and really understands the game and his role in the system. Let’s hope its a season to remember for him and fellow senior Captain Lance Thomas. 2. Mason Plumlee is a BEAST. If Mason can play like this in the ACC, things are looking really, really good down low for Duke this year and beyond. 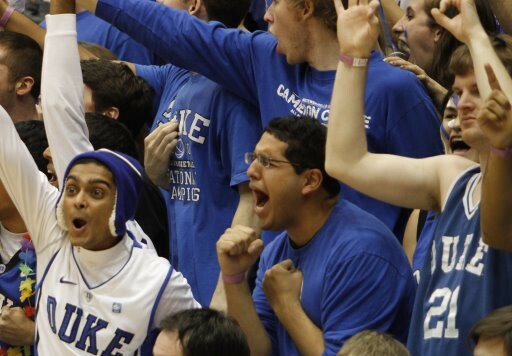 These next few weeks could be incredibly exciting for Duke basketball. On Friday, Kyrie eliminated Indiana from his list – a school previously thought to be in contention. With his official visit coming up this weekend, Duke is sitting pretty with a player who may be “the next Jason Williams“. 4. Harrison Barnes…what more is there to say? Yeah, Harrison’s pretty good at basketball. A surprisingly positive take from The Dagger on Duke’s decision to allow graduate students to sit behind both baskets in Cameron this season. Check out our Photos page to see what the hallowed arena will look like this year! Countdown to Craziness: Be There. Lo and behold, college basketball season is almost upon us. On October 16, Coach K and the team will open the season with “Countdown to Craziness” in Cameron. Follow the jump for everything you need to know about what looks to be a hell of a weekend. Thanks to DBP once again for the link.